If you’ve been following me on Twitter the last couple of days, you’ll know that I was inspired by my friend Gordon McAlpin’s excellent parody poster for Memento that I finally got off my rear end and put together a parody poster for Iron Man that I’ve been thinking about for months. I’m proud enough of my work that I’m printing up 50 copies and plan on selling them as 11 x 17″ prints at Chicago Comic-Con this weekend. We’ll see how they do. If I have any left over, I’ll sell them here. If the demand is high enough, I’ll print up more! Either way, I thought you guys might like to see it. Don’t forget: I’ll be at Artist Alley table #3414. Please come by and see me. I’ll be selling copies of both books, all of my t-shirts, the Iron Man parody poster and original sketches. I look forward to Chicago Comic-Con all year and with the stars aligning between the convention, our 7th anniversary and 1,000 comics… I think this is going to be a good show for me. If you’ve been following the site for the last couple of days, then you know Cami and I welcomed our second child into the world on Thursday. We named her Pearl Evelyn Brazelton and we brought her home yesterday. Mother and daughter are doing fine and Henry reacted splendidly to her arrival. Seriously – It couldn’t have gone better if we had scripted it. Even Truman minded his P’s and Q’s with a new baby in the house. Anyway, with a new baby in the mix, I will be running guest strips through the rest of December. There are a lot of great artists that selflessly lent the time and talents to help out and I think you’re going to be really happy with the comics I have lined up. Kicking off the festivities is Brian Carrol from Instant Classic. Brian and I go WAAAAY back. 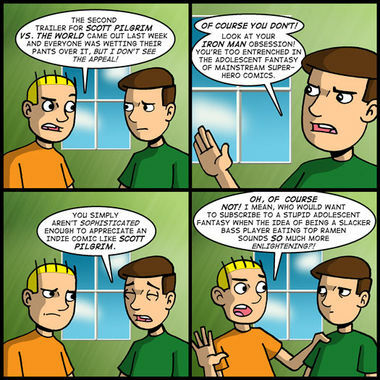 I’ve known Brian since he was kicking around his journal comic BriWorld around 2002 or 2003. Brian is a true Renaissance man. He not only talks the talk, but he walks the walk. By that I mean, not only is he extremely knowledgeable about movies, but he makes his own movies as well! Top that! Fans of The Triple Feature might remember that we invited Brian on for a series of recordings in 2007. He brought a lot to the table and it was a treat having on the show for a while. Specifically because I think Brian is one of those guys that has a very high level of understanding about film, but can keep a toe in the water of more mainstream affairs. And I think that talent is plainly on display with his guest strip. 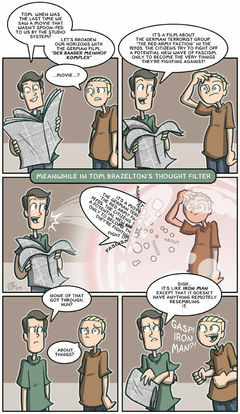 The fact that he gave visual representation to Tom’s “thought filter” is evidence of that. It’s a great idea. I wish I had thought of it! So thanks again to Brian and be sure to visit his site Instant Classic! Anyway, it’s up and running. So show Steve some link-love and congratulate him on his anniversary. For those of you visiting Theater Hopper from Dueling Analogs… Welcome! Next item of business… Kickstarter. Since Pearl came a week early, it kind of throws a wrench in my plans in terms of promoting the fund raising campaign for Theater Hopper: Year Three. There are THREE WEEKS LEFT in the campaign and we are $2,000 away from goal. Things are only going to get more hectic as the holidays approach, so I really need your support NOW to help make the third book a reality. PLEASE pledge to the campaign – even if it’s only a dollar. If everyone who visited the site on a daily basis pledged only a dollar, this book would be funded and off to the printers. Not to lay a guilt trip on you, but please consider that I have been providing free entertainment (largely uninterrupted) three times a week for over 7 years and ask yourself what that is worth to you. Without your support, this book will not happen. And if I can’t raise the money through Kickstarter, it’s very likely that the book might NEVER happen! I will probably have to give up on self-publishing completely. I realize that not everyone can pledge to the campaign either because they don’t have a credit card or because they are from a country outside the United States and Kickstarter doesn’t accept international credit cards. But if you CAN pledge, PLEASE DO. Your pledge of support can make a difference. With so many obligations in my personal life at the moment, you would be doing me a great favor to help me now rather than wait until the last minute. Last item of business… Thank you. Thank you to everyone who sent notes of encouragement and well-wishes over the weekend when we announce Pearl’s birth. It means a lot to me that so many of you are thinking of us and offering your words of support. It makes me realize how lucky we are – Not only to have a happy and healthy little girl, but to have so many people in our lives who care and express their happiness for us. Not a drop of it goes unnoticed or unappreciated. So, thank you again – from all of us. That’s it for now. Expect a new guest strip on Wednesday. For now, I’m off to cuddle my new baby girl!!! 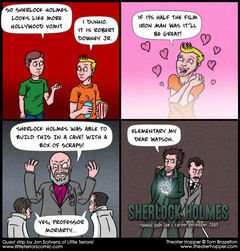 A comic about Sherlock Holmes should come from someone British, don’t you think? I do. That’s why it worked out so perfectly for our friend Jon Scrivens to provide us with one! Jon is the creator of a macabre web comic called Little Terrors! and if you want to see how they do thing across the pond, then you should check it out! Part of me wonders how British people feel about American actors playing classic characters of British literature. I know there was a lot of hub-bub about using ANY American’s in the Harry Potter films, but I’ve heard no such uproar about Sherlock Holmes. Weird. Movie producers would catch hell if some British production company had Kenneth Branagh play Davy Crockett. I didn’t get a chance to see Sherlock Holmes over the Christmas weekend, but hopefully I’ll get to see it in the new year. Critics kind of seem to hate the idea of taking a literary character known for combating his enemies with his intelligence and turning it him into a squalid brawler. But of all the friends I know who have seen it, most have come out of the film feeling very positive about the experience. I was kind of disappointed that I didn’t make it to the theater this weekend for another reason. Apparently it was the largest box office weekend in history with $270 million in tickets sold and I missed it. What really astounded me is that Avatar only lost 2% of it’s business from the previous weekend and since that time, it’s been bringing in $15 to $20 million daily. That’s nuts. That’s pure blockbuster right there. I was kind of suspicious of Avatar’s ability to be a long-term earner. But this thing has a “gotta see it on the big screen” vibe stamped all over it. Certainly an event. Not much else for me to talk about today. Due to New Year’s there’s nothing really interesting coming out in theaters this weekend. I suppose I could mention the Kickstarter fund raising campaign for Theater Hopper: Year Three one last time. As of this writing, there are 28 hours left in the campaign. It ends on December 31, so by the time I update on Friday, it will be over. As you know, we’ve met goal. So I’m not aiming for more money. But if there are any rewards you would like to take advantage of by pledging, this is the 11th hour. I won’t be offering these incentives in the future. So if you want to take advantage of them now, this is the time to do it. That’s all I have for now. Has anyone here seen Sherlock Holmes? What did you think of it? How was Robert Downey Jr. in the role? Would you recommend it? Leave your comments below! I apologize for the delay on Monday’s comic. I was absolutely stymied by how to draw the interior of the bus in the last panel. Paralized, almost. I kept telling myself “This is a good thing” because, as I explained to myself, this kind of fear meant that I was operating outside of my comfort zone. I’m evolving my style – if only incrementally. You have to embrace it. I think, so long as people are reacting favorably to the recent story line, I might as well go for broke. Although, I worry that it was a lot of stress and effort for not a lot of payoff. I wish the joke could have been stronger. I think the crazy guy barking at Cami is cute, but not laugh out loud funny. Oh, well. I suppose if push comes to shove, it’s the nesicary transition piece to move the story from the exposition to the action. Look for more of what you loved about the first three strips in the next few strips. The good news is that I have everything plotted out at this point and envision this arc going on for at least two more weeks. I don’t want the story to wear out its welcome, but I think I have some good gags coming up, so stay tuned for that. Switching gears, you might have noticed that the site has undergone another redesign. It’s not quite finished, yet. There are some tweaks to make here and there. But the functionality is in place and that’s what matters most. Along with the new coat of paint, there is a TON of functionality behind the scenes that I think is going to make your experience more entertaining. I haven’t even explored all of the options yet, but a few I can tell you about off the top of my head are things like the new “RANDOM” button in comic navigation as well as links to similar comics at the bottom of the blog. Hopefully, you will use these to explore more of the site and maybe take a trip down memory lane. Other advantages of the souped up back end will be a special members area for people who donate to the site and also the option to BUY PRINTS of you favorite comics. Selling prints is something I’ve wanted to do for a long, long time. So I am very excited by the potential of this. I plan to keep the cost low (and hopefully the quality high) and really push that in the future. But, like I said, there a few things I need to put in order first. The Theater Hopper storefront chief among them. I’m testing out store management systems like Magento and Open Cart and will hopefully have something put together soon. There are also pages under the ABOUT, LINKS and CONTENT areas that needed to be added back in. If you have thoughts or ideas about what features or improvements YOU’D like to see on the site, now is the time to suggest them! We’re cleaning house, so anything you can suggest that would make your experience better, please let us know. You can either leave your comments after this blog or on the recently reintroduced THORUM. This is the third time around for our little forum community. The first two utilized the phpBB software package and were taken down by relentless spamming. This time around, we have a far more simplified system utilizing bbPress – which is kind of an extension of WordPress. Hopefully, it will be a lot less buggy and allow us to carry on the kind of sustained conversations that comment under the blog do not. Anyway, lots going on right now. I appreciate everyone’s patience waiting for today’s comments and I can’t wait to read your comments, feedback and suggestions about the new look and feel! I think most of you figured out pretty early on that this little dress-up adventure was going to bring Tom, Jared and Cami into conflict with Victor dressed up like Whiplash, the newly introduced villain of Iron Man 2. It makes sense. Whiplash is a muscle-bound Russian scientist who wears orange pants. Victor is a muscle-bound Ukrainian movie theater manager who wears a red bow tie. The parallels are obvious. The big question is why does Victor’s costume appear to be a fully-functional and lethal weapon as depicted in the movie? We’ll get to that later. But, for now, dig that crazy electricity! Looks good, right? I don’t know if it makes that much of a difference if I see 2 seconds more that I hadn’t seen previously. I’m pretty sure I’m going to be over the moon for this film regardless of how pristine I manage to keep myself before walking into the theater. I seriously need to plan ahead better. Switching topics, Cami sent me an interesting e-mail the other day. She said she wants to see the documentary Babies this weekend. In case you aren’t familiar with the plot of the film, Babies follows around four, well… babies from around the world – Tokyo, Mongolia, Namibia and San Francisco – essentially prompting replies of “Awwww” for 90 minutes. It’s a perfect piece of counter-programming against the hype surrounding the testosterone and AC/DC-fueled experience of Iron Man 2. “Oh! Oh! I want to see that, too.” But you could tell she had momentarily forgotten about it. Don’t get me wrong, I’d like to see Babies, too. The trailer for it is brilliant and it gets me every time. Watch it right now if you don’t believe me. But here’s the thing… we have a 5 month-old at home. We’re kind of LIVING this movie right now. So finding a babysitter so we can go and watch a documentary about babies seems kind of backwards. Although maybe I shouldn’t complain. If we manage to see two movies this weekend, that would be amazing. I should probably try to play the lottery if that happens, because I doubt I’ll ever get that lucky again. 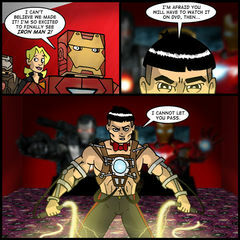 Are you guys getting worked up for Iron Man 2? Has anyone else entered “lock down” mode? How successful have you been. What about Babies? Is anyone else kind of excited to see it. I’m curious what the reaction to the film is between people with kids and people who don’t have kids. I probably would have rolled my eyes at a film like Babies a few years ago. But watching the trailer now actually kind of makes my heart swell with pride. I can’t tell if it’s because the trailer is well made or if it’s just pushing the Parent Button. Also, don’t forget about the recently reintroduced THorum! If you’re interested in having more long-term conversations and talking to other readers from the site, create an account and submit a topic! Let’s get talking! But, then again, there usually isn’t a call for laser whips in an average comic. So “strike while the iron is hot,” I suppose. Speaking of iron, as you know, Iron Man 2 comes out today. I think I’ve done a pretty good job of staying away from reviews and spoilers. That is, unless you count the comments I get from readers in the UK who have already seen the film telling me how great it is. I don’t really count those as spoilers, I guess. It’s good to know the fans are liking it, though. I’ve heard through the grapevine that I need to stick around until after the credits. But considering the bomb they dropped on us with Samuel L. Jackson as Nick Fury in the first one, I think that was kind of a foregone conclusion. Still trying to figure out how we’re going to squeeze both Iron Man 2 and Babies into the same weekend that our families are supposed to get together for Mother’s Day. But Cami and I are crazy like that. We tend to stack these kinds of things. Head’s up for next week… I have a fairly lengthy paper I need to finish for one of my college courses and it’s due on Tuesday. As a result, Monday’s comic might be late. I don’t want to do that if I don’t have to because I’m sure you guys want to read my reaction to Iron Man 2 in Monday’s blog. But this paper is supposed to be North of 25 pages long and (shamefully) I haven’t started it yet. I’m not panicked, though. I can run off at the mouth for quite a while if I have to (which longtime followers of this blog can attest to.) I’m lucky that the paper is mostly an opinion piece. It doesn’t really have to be researched – although it does need to make some references to what I’ve learned over the semester. Anyway, like I said, I don’t want to push off Monday’s comic if I don’t have to. But the option is on the table. In the meantime, I’m just waiting for my opportunity to see Iron Man 2 with Cami. It’s like the calm before the storm. I don’t know what else to say. So much anticipation has built up to this point, I can scarcely believe that the sequel is actually happening. To say I’m looking forward to it would be… I think, the understatement of the year. Feel free to post your reactions to Iron Man 2 in the comments below. I might stay away until after I have a chance to see the movie myself. But I’ll be checking in over the course of the weekend to discuss things. Try to stay away from spoilers if you can. Thanks – and have an Iron-riffic weekend! I realize this comic might get me in a little bit of trouble with the pants-wetting crowd excited for Scott Pilgrim Vs. The World. Don’t get me wrong. I’m excited to see it, too. But after watching the effusive praise pour in across Twitter last week when the second trailer was announced, I was left wondering what all the fuss is about. I’m certainly not making the case that mainstream comics are better than indie comics. But I will go out on a limb and say just because it’s indie doesn’t mean it’s automatically better. Now, as someone who has never read Scott Pilgrim, maybe I’m not the best person to be critical of the movie adaptation. I can certainly understand someone who has never read an issue of Iron Man looking at me with skepticism. But here’s the thing… When the FIRST trailer for Scott Pilgrim came out, I felt it was trading heavily on that “Hey, geeks! You know that thing you love? WE MADE A MOVIE OUT OF IT!” mentality. There wasn’t anything specifically about the first trailer that made someone like me – someone who is not ALREADY indoctrinated into the cult of Scott Pilgrim – excited to see the film. The second trailer fine-tunes things a little bit. I feel like it’s been put together much more effectively. But there’s still so much of that mid-90’s digital hipster smarm dripping from that thing, the Old Curmudgeon in me kind of curls his lip at it. Say what you want about Iron Man. But the first trailer made you want to see the movie. Anyway, like I said, I’m still going to see Scott Pilgrim when it comes out because I like the look of it. All I’m saying is that I’m a little skeptical based on the effectiveness of the first two trailers. Maybe it’s because I know a lot of people in comics, the feel like this is a victory for them – seeing something like Scott Pilgrim on the big screen. 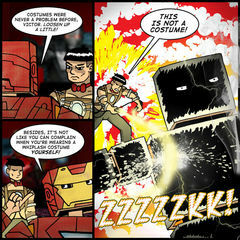 Maybe they’re pre-disposed to thinking it’s awesome just like I was pre-disposed to thinking Iron Man would be awesome. Maybe I should just shut up and read the books. Maybe then I’ll understand what the fuss is about. But my point is… I shouldn’t have to read the books first. The strength of the material should already be evident in the trailers. Maybe that’s because they were cut together poorly. But I’m just not seeing it yet. What do you guys think? Is there anyone else out there confused by the hype surrounding Scott Pilgrim? Everyone I’ve talked to is basically screaming at me to read the books, but I’m dragging my heels. Am I wrong? Leave your comments below and let’s get the conversation started! Okay, if you’ve been on the internet at all today, you know that the first trailer for The Avengers is tearing thing up. Immediately I was impressed that there was an adversarial tone between the individual members of the team. “I don’t play well with others,” Tony Stark quips. “Big man in a suit of armor – take that away and what are you?” Captain America sneers. Oh, and is that Thor taking a flying leap, about to smash Captain America’s shield? This is all very much in keeping with the comics. The “friendly misunderstandings” that lead to heroes battling each other before banding together to fight the common enemy. Total “Who Would Win in a Fight” geek bad-assery on display here. Clearly Joss Wheadon is giving Tony Stark all the best lines – at least in the trailer. I hope this is the case throughout the movie. One of the biggest advantages to the Iron Man films was Robert Downey Jr’s motormouth style. With a script by Wheadon, you’ve got the best of both worlds when it comes to words and delivery. What I really like is how close to the vest they’re keeping Jeremy Renner as Hawkeye and Mark Ruffalo as the Hulk. Barely any screen time or dialogue for either of them in this trailer. Everyone else we’ve seen in action in other movies. But these two are the last unknown variables. Expect Marvel to continue to keep fans on a string regarding those two.